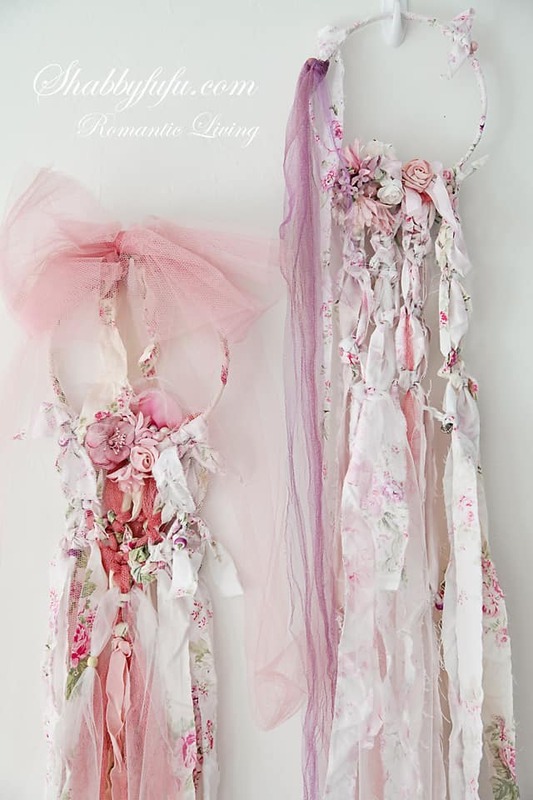 I was inspired by some of my favorite places to shop like Free People, Rachel Ashwell Shabby Chic Couture and Anthro, and a bit of the current boho trend of Dream Catchers that dates back to the Native Americans. This project started because I’ve been wanting to dip my toes back into the macrame waters….which I used to do quite heavily back in the day, taught it to my students, and once made an entire room divider using macrame techniques! At the moment I had no cord available, so for these I used fabric scraps in pastel tones. They were started on embroidery hoops that I had lying around the studio and went from there. Vintage tulle, vintage millinery, hand made ribbon roses, beads..etc were used to embellish. what a lovely take on this style! 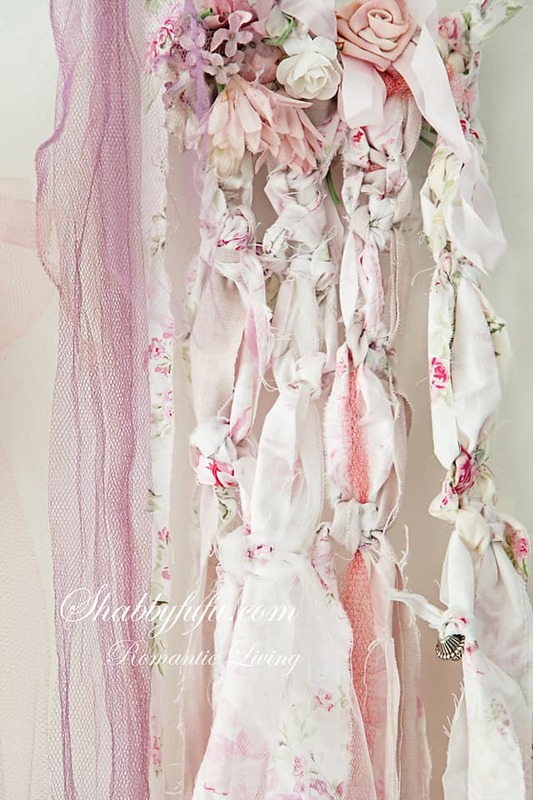 These beautiful floral fabrics and textures really remind me more of romantic headpieces. so pretty! What a great combination between dream catcher and macrame! I so remember macrame too.Lol My Mom and her friend use to make some great things,I only tried it a few times. Oh wow–those are so pretty! All the preettiest put together–love it! Oh Janet this is so beautiful-LOVE it!!!!! Wow! I fell in love with your creations. Those are really adorable. 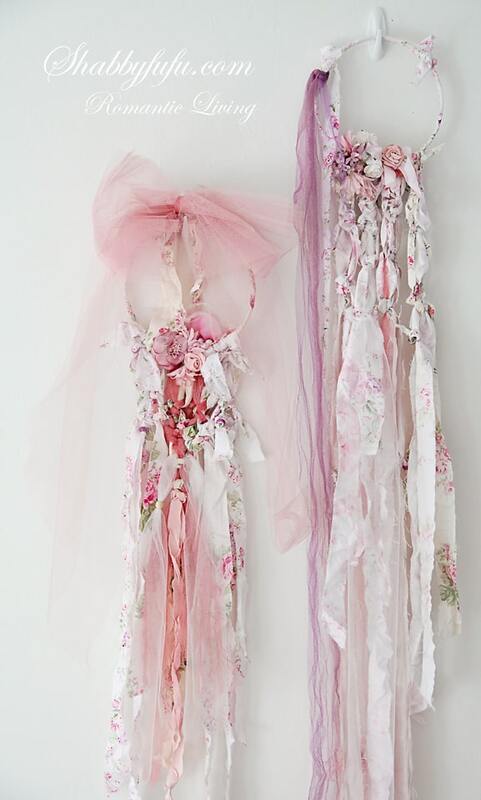 It has a feminine impression that would surely great any girls’ room.